“Image/Object” Vaporized aluminum over fiberglass resin 24 x 18 x 10 inches by Tom Devaney at T. Devaney Fine Art in Concord. Americana Music: In a way, Miss Maybell and Slimpickin’s are throwbacks. They pose like a Grand Ole Opry comedy act (think Minnie Pearl) and play music from the 1920-1930s-era, jug band, ragtime, jazz and blues with sincere virtuosity. But digging up America’s musical roots seems to be the hottest thing going in contemporary sound, so maybe they are just ahead of the curve. They come from Jackson and keep mum about their mundane identities, preferring audiences get to know them as their homespun personas. Slimpickin’s writes songs and plays classic finger-style guitar; Miss Maybell plays banjo and taps her steel brushes on a tricked-out washboard. She also commands an impressive kazoo, but the secret weapon they unleash is Maybell’s vocals — deep and strong enough to join an angel choir with the likes of Bessie Smith and Billie Holiday. Children’s Music Performer: Forget The Wiggles. With his school and library performances and recorded CDs, local singer/storyteller Steve Blunt’s tunes keep kids entertained and educated. Little ones can laugh at humorous numbers like “There’s a Vampire at My Door” or groove to Australian indigenous music with a kid-friendly twist on “Kangaroos and Digeridoos.” He tells local stories too, like the tale of the Hutchinson Family Singers, a 19th-century Milford band that forms the center of his sessions on the historical music of New England. Classic Rock Big Band: Mike Girard is the known as the big voice in Boston band The Fools, but his latest project could change that equation. Mike Girard’s Big Swinging Thing takes The Fools’ party vibe to a whole new level. It’s a classic cover rock band with big band horns, wild stage antics and a groove so deep you just slide in and enjoy the ride. Guest performers and a variety-show schtick keep things lively, but it’s Girard, as madcap bandleader, who keeps the audience pumped with non-stop energy and fun. Classic Shakespearience: Modern, big-screen interpretations of Shakespeare’s plays are all well and good, but there’s something magical about classic productions of the Bard’s work performed by enthusiastic members of your community. Advice to the Players has blended theatre professionals, enthusiastic community folks and even a few teenagers to perform Shakespeare’s works in the Lakes and White Mountains regions since 1999. In the summer, you can see outdoor performances at the Sandwich Fairgrounds Stage in Center Sandwich or catch them indoors at Your Theatre at M&D Productions in North Conway or at the Sandwich Town Hall Theatre. Edgy Photographer: Jay Philbrick of Philbrick Photography likes to dangle newlyweds off of cliffs. Specifically, the imposing Cathedral Ledge in North Conway. The story of his daring and unusual (to say the least) wedding photos recently went viral, appearing most recently on “Inside Edition,” the latest in a long string of national — and global — attention. After Jay and his wife and photography partner Vicki posted some of the shots on Facebook, they were picked up by “New Hampshire Chronicle,” Cosmopolitan, Buzzfeed, the Huffington Post and even Britian’s Daily Mail, among many others. 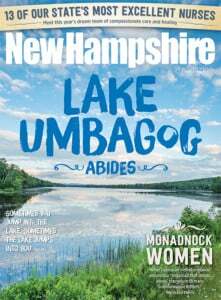 Not to brag, but we like to think we “broke” the story first way back in our special Bride magazine and then again in January 2014 in New Hampshire Magazine. Just saying. Festival Revamp: Motorcycle Week in Laconia has revved along just fine for the past 93 years with dozens of sidekick booths and attractions, but this year the addition of the Laconia Fest concert series seems likes worthy sidecar happening. They certainly went big, luring Bret Michaels and Steven Tyler (among others) to play. The Weirs Drive-In is perfectly placed to allow the music to provide some background to Bike Week. It’s risky offering a Best of NH to an event that hasn’t happened yet, but, like riding without a helmet or inviting a few thousand bikers to cruise your roads for a week, risky living is just part of the Granite State lifestyle. Fiddler: If a town can have a village smithy, why can’t a state have its own official fiddler? If anyone has earned the title, it’s Jordan Tirrell-Wysocki. He got his big start at 12 as the youngest member of the state’s delegation to the Smithsonian Folklife Festival. Since then, he’s performed in various groups and played with just about any local or visiting artist in need of a fine fiddler to perfectly punctuate a melody. He’s toured nationally with the Adam Ezra Group (see him play on their NSFW “The Devil Came Up to Boston”) and opened for acts ranging from Tommy Makem to Willie Nelson. Historical Band: The Hardtacks are mostly Marek Bennett and Woody Pringle, but, when you play Civil War and Antebellum-era music, you tend to draw a few like-minded folks to your campfire. A banjo and fiddle number one week could turn into an entire ensemble with dulcimer and accordion the next. They perform in period costume and sometimes in front of a 19th-century field tent. A Hardtacks performance is a participatory immersion in bygone folk traditions and, as a result, is perhaps the closest thing you’ll find to a trip back in time — a journey best taken on the wings of music and song. Listening Room: In terms of space, atmosphere and talent base, there’s no better place to take in a performance than Pitman’s Freight Room in Laconia. It’s built out of a former freight depot off to the side of the city’s recovering downtown. Completely renovated but still packed with character, Pitman’s features a big dance floor and excellent sound and light. Mostly it offers the kind of vibe that musicians like — intimate with warm acoustics and comfortable seating. That may explain why they’ve become a nucleus for the local singer-songwriter scene. Meta Gallery: For a couple of years, a giant eyeball has kept watch over the intersection of Main Street and Pleasant Street, right in the heart of downtown Concord. It was a work of projected art by artist and gallery owner Tom Devaney at his T. Devaney Fine Art. It’s recently been replaced by two giant scrims that allow Devaney to turn his second floor corner studio into what appears from the street to be a giant fish tank or perhaps a room full of colorful drifting spheres or just about anything that strikes the artist’s fancy. Once he has your attention, Devaney’s weirdly whimsical (or sometimes seriously thoughtful) work, on display in his gallery, is well worth a trip up the stairs. Neo-Shakesperience: It’s a good question for a third goblet of malmsey. If Shakespeare were alive today, where would you take him to see his work performed? There are fine NH companies that keep his words alive for new generations (see Advice to the Players on page 73), but perhaps he’d like something edgy and designed to take his stories to the people with the same kind of immediacy they delivered on the stage at the Globe Theatre. If so, you’d do the Bard a service to take him to a Seven Stages Shakespeare performance at Prescott Park in Portsmouth, or maybe he’d have fun at one of their ShakesBEERience readings at the Press Room. Or, if modern life was not already too dazzling, you might just call up their No Holds Bard podcast on your smart phone. What would William make of that? New Artist: We reviewed her rising career as recording and film star in our June issue, but Anna Madsen’s new album of songs, "Efflorescence," featuring guest performances from original Genesis guitarist Anthony Phillips confirmed our impression that she’s something special: a new voice (and haunting lyricist) who has something lovely, mysterious and enduring to add to the music scene, both locally and (we think) nationally. New Theatre: The Hatbox Theatre took over the old Coldwater Creek space at Concord’s Steeplegate Mall in March and since has been attracting grateful crowds to see theatre, magic, comedy and music. The new space takes advantage of the stylish store’s “bone structure” by installing theatrical lighting and about 90 comfy theater seats. Mall management is grateful too that someone was willing to think outside the typical mall “box,” to create this charming little hatbox of a theatre. Poetry Hub: As non-poet Ron Burgundy might put it, New Hampshire is kind of a big deal in the world of poetry. Four US Poets Laureate hail from the Granite State, and one of the most iconic poets of all, Robert Frost, has two separate farms, in Franconia and Derry, dedicated to his life and work. Both are well worth your time to visit. The Robert Frost Farm in Derry has become a vital hub for poetry, featuring readings, conferences and workshops where the art of poetry, and the cosmic spirit of its namesake, are preserved and shared with a world in dire need of some carefully chosen words. Radio Station Event: The variety show never really went out of style; it just became the holiday special. For the Granite State take on the seasonal performance spectacle, don’t miss the Morning Buzz Christmas Ball. Hosted by the effervescent Greg Kretschmar, the Buzz Ball draws incredible local talent onto the stage and makes the whole audience feels like they’ve had just enough eggnog to actually join in on the singalong portions. It’s a feel-good extravaganza that’s just as warm and fuzzy as some new flannel PJs and as loud and over-the-top as Aunt Edith’s favorite Christmas sweater. Singer-Songwriter: Listening to the soulful guitar and vocal stylings of Tristan Omand, you can see why he lists Bob Dylan and Hank Williams among his influences. Pay attention to the stories of his lyrics, though, and two of his more unexpected influencers come to the fore: Jack Kerouac and John Steinbeck. Omand’s literary-musical talents have produced four albums so far, and we have a feeling this is only the beginning.